Two restaurants a seasonal outdoor pool free Wi-Fi and budget-friendly rates are welcome features of the Fall Creek Inn & Suites conveniently located on Highway 165. The three-story Fall Creek Inn & Suites has exterior corridors and 101 rooms some non-smoking and all with cable TV and free Wi-Fi. The hotel has both a steakhouse and a barbeque restaurant. When not exploring all Branson has to offer guests can relax in the seasonal outdoor pool or barbecue a meal in the hotel's picnic area. A gift shop and fax and copy services add convenience. Pets are allowed for a fee and parking is free. 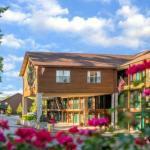 Located on Highway 165 the Fall Creek Inn is two miles south of the city's theater district. Other attractions within two miles include the Titanic Museum White Water Park and 90 Outlets shopping center. Table Rock State Park is five-and-a-half miles south. Branson Airport is 15 miles away and Tulsa International Airport is about 200 miles southwest.